A gunman was armed with "hundreds of rounds" of ammunition when he opened fire at Los Angeles International Airport Friday, killing a security worker and spraying a terminal with bullets as travelers sought cover, authorities said. "There were more than 100 more rounds that could've literally killed everybody in that terminal today," Mayor Garcetti said at an afternoon news conference, lauding law enforcement's response that he said saved many lives. The alleged shooter was identified Friday afternoon by FBI agents as Paul Ciancia, 23, of Los Angeles. Ciancia is a former resident of New Jersey, said David Bowdich, FBI special agent in charge. 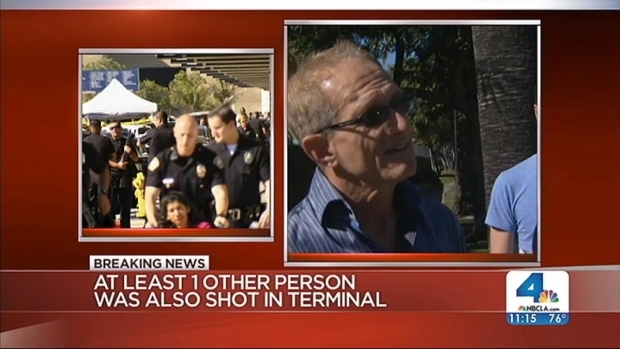 A passenger waiting for a flight describes a shooting at LAX. 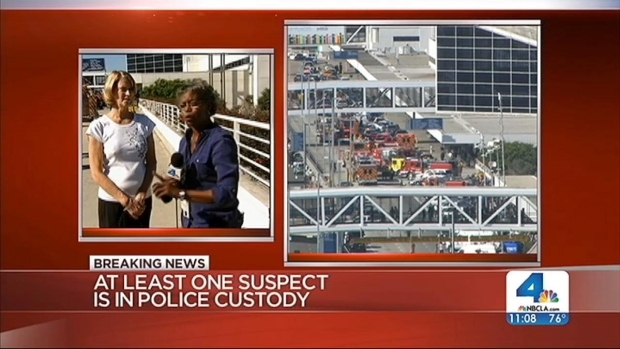 The "lone gunman" entered the screening area in Terminal 3 and pulled a rifle out of his bag, opening fire before he was taken into custody after an officer-involved shooting, said Patrick Gannon, the chief of police at LAX. Three TSA workers were struck by gunfire, one of them fatally. TSA identified the slain officer Friday night as Gerardo I. Hernandez, 39. A friend of Hernandez who used to work him at LAX described the victim as a "very proud" father of two and a husband who spoke at great length about his family. Carol Stubbs was on her way to a wedding when a gunman fired a rifle inside a terminal at LAX. Toni Guinyard reports for the NBC4 News at Noon on Friday, Nov. 1, 2013. Two other TSA officers were wounded and are recovering, TSA Administrator John Pistole said in a letter to his agency that was obtained by NBC4. In addition to the injured TSA officers, other victims appeared to have suffered "evasion injuries" -- or injuries inflicted in the chaos of running away, Bowdich said. Witnesses described seeing shell casings, broken glass and blood on the ground in the terminal. "He walked to Terminal 3, pulled an assault rifle out of a bag and opened fire in the terminal," Gannon said. "He went into the screening area, past screeners and continued shooting into the airport itself." FBI officials said the agency will "investigate the shooting and the motivation behind it." A bag used by the gunman to carry his weapon into the terminal was found to contain notes with anti-government sentiments written on them, law enforcement told NBC4. 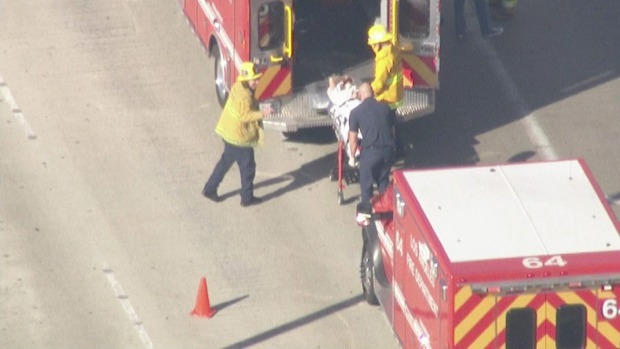 A spokesperson for UCLA Medical Center confirmed that one victim was hospitalized in critical condition and two were in fair condition at mid-day. It was "not clear" whether the critical patient was the gunman, Dr. Lynne McCullough said at a news conference. The deadly shooting raised questions about security at the nation's third-busiest airport. Airport police thought they had improved checkpoint security by moving officers into the lobby ahead of the screening areas, but a troubled 23-year-old allegedly found a weakness, opening fire inside the terminal. Screening LAX visitors before they enter the airport had been suggested several years ago, but was rejected as impractical. The 9:22 a.m. PT shooting Friday prompted evacuations, street closures and a ground-stop order for all incoming flights at the world's sixth-busiest airport. Several travelers told NBC4 they heard gunfire in the terminal. "We were just standing there and someone started shooting," witness Nick Pugh said. "I heard a total of maybe eight or 10 shots fired." Pugh said he saw a man believed to be the gunman being chased by officers, but authorities have not confirmed that subject was involved in the shooting. Several people were questioned by law enforcement agents as they searched the terminal. A camera positioned above the upper level road at LAX showed travelers running from an exit at the Tom Bradley Terminal, where passengers depart and arrive for international flights. Paramedics and other public safety personnel helped travelers, some in wheelchairs, to a triage area established outside the terminal. "People freaked out," said witness Tim Daley, who reported hearing 15 rounds. "No one knew what to do." Luke Love, a witness in Terminal 3, said he heard two loud bangs while he was taking his shoes off at security and saw a gunman dressed in all black walking up stairs with what Love described as an assault rifle. Love, his mother and 10 other people were corralled into a room with the lights off and a copy machine blocking the door when he heard more shots, Love said. LAPD issued a tactical alert, meaning all personnel will remain on duty until the situation has been resolved. Roads near the airport were closed until late Friday evening, but have since been reopened to all vehicles, including those dropping off and picking up travelers. Earlier in the day, some travelers got out of their vehicles and began walking to the airport with their luggage. As incoming flights landed during the shooting investigation, they were subject to a ground-stop order. At least two flights were diverted to Ontario International Airport, located east of Los Angeles. In all, some 76,000 passengers were affected by delayed or diverted flights, an LAX spokeswoman said. The shooting comes more than 10 years after a gunman walked up to a ticket counter for Israel's national airline, El Al, at LAX, killing two and wounding four in a July 4 terrorist attack. President Barack Obama was briefed on the situation, according to authorities.